For his latest film, Like Someone in Love, director Abbas Kiarostami ventures into the land of escorts with cheerful fun-time calling cards. Like Someone in Love is a logical follow-up to Abbas Kiarostami’s Certified Copy (2010). From its opening long take — the lead character speaks from outside the frame — the director’s sleight of hand draws us headfirst into this tale of purposeful miscommunication and calculated role-playing. Certified Copy was the first narrative feature Kiarostami filmed outside of his native Iran. 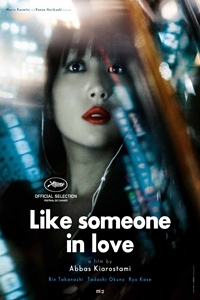 Like Someone in Love was shot entirely in Tokyo with a Japanese cast. Akiko (Rin Takanashi) — co-ed by day, call girl by night — is coerced by her pimp into turning a trick with a preferred, recently widowed client (Tadashi Okuno). The two form a precipitous alliance during the course of two days spent together. A painting that hangs in the old man’s apartment adds a key piece to the film’s puzzling themes of resemblance and character. Akiko’s uncle gave her a certified copy of the picture, Training a Parrot, when she was 14. The child in the picture bears a striking resemblance to Akiko. “He told me it was my portrait,” she recalls, “that he painted it.” To the old man, it’s a picture of a girl teaching a parrot to speak, but according to Akiko’s grandmother, it’s the parrot that’s doing the coaching. There is not a shot or gesture in the entire film that could not withstand rigorous visual analysis, yet this is far removed from the “coffee table movie” pleasantries of, say, Anna Karenina or Les Miserables. It’s the work of an assured master whose greatest virtue is making it all look so easy. The title connotes more than just the lush tones of the Ella Fitzgerald song after which it was named. Like Someone in Love perfectly sums up the glow cinenthusiasts will feel upon exiting the theater.